Contraptor components can be made at home with simple tools, using inexpensive materials and parts readily available online and in hardware stores. 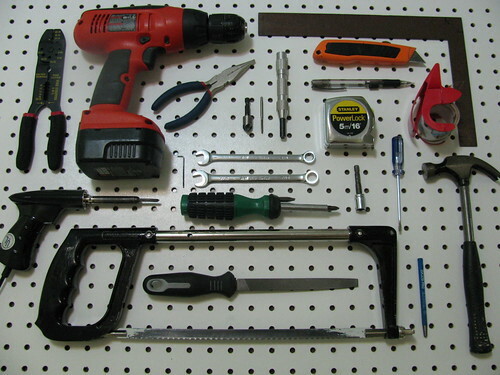 This is the list of tools required to make the Contraptor set. The Contraptor set is designed to be made from a small number of inexpensive materials and parts: aluminum angle and square tube, UHMWPE channel, bearings, pulleys and belts, motor couplings, all-thread rod, generic fastener hardware. Generic hardware, all-thread rod and aluminum angle can be bought in hardware store on demand. Larger quantities are generally cheaper to buy online. Each of the Contraptor kits has Bill of Materials listing the part numbers, quantities and vendors of parts and materials included in the subset. Many 3-axis robot projects only use a small portion of Contraptor components. On the other hand, some custom contraptions may require a few additional parts, usually belts or threaded rods of different lengths and/or electronics/motors for additional axes. These additional parts are few, inexpensive, and can be reused in future projects. Each contraption should also have a BoM listing all of the required parts and materials for it. 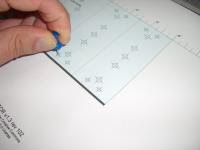 If you know how to use paper templates for drilling/sawing, go directly to the component you want to make. Otherwise, read the Howto section below. 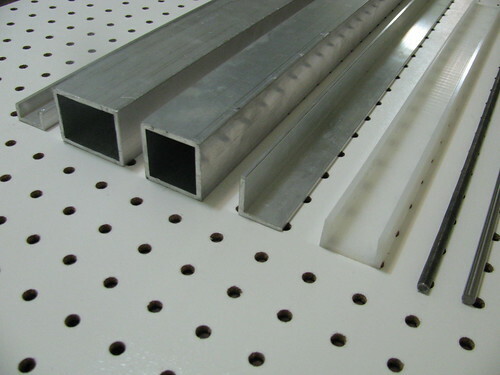 This section describes how to make a component part from aluminum angle or tube using a template. 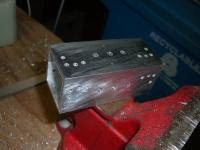 This method can be used to make virtually all aluminum component parts of Contraptor. 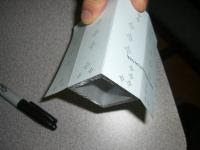 Paper templates are attached to material with scotch tape. Adhesive labels can be used instead - they are faster to apply, but plain paper/scotch is faster to remove. 1. Print out the template. 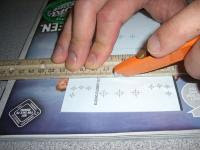 Compare printed ruler with a measuring tape (both X and Y) - if the error is significant (≥1/32" per 6"), try scaling the page up/down in the print settings. Puncture the hole centers with a needle or a push pin. Try to get exactly in the center - these holes help to guide the center punch. 2. Cut out the label using ruler and hobby knife along the solid lines. Score the dashed lines. Try to stay exactly on the line and be careful not to cut through. Unless you're making lots of components, make sure the angle/tube piece is not too long - it is more convenient to work with shorter pieces. 3. Tape one edge in several places, then tightly wrap around and tape the free edge. Also tape the corners and other places where you're going to saw. Try to avoid taping over the punctured hole centers. The edges should match up if you did everything right. If you're using adhesive label, peel off the backing, bend the label and apply it to the angle, corner first, then sides. If it's the square tube, apply middle corner first, then inner sides, then outer sides. 4. Place the angle/tube with the label on a sturdy surface and mark the holes with a center punch and a hammer. If you're using adhesive label, hammer strikes may shift the label if the piece is in the vise. 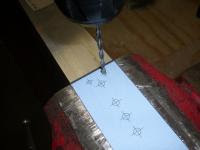 Using marks as guides, drill the holes in the angle. It's good to lubricate the drill bit with some candle wax. 5. Once the holes are drilled, saw where marked and deburr with a file. Remove the template. Deburr the holes with countersink bit.